It all started at Dachau, the first concentration camp in Germany . Johnny Cash never actually shot a man in Reno just to watch him die. But the rowdy inmates of California’s Folsom State Prison didn’t seem to mind, loudly cheering the country icon as he sang those famous words in Folsom Prison Blues, which hit the Billboard Hot 100 singles chart 50 years ago on May 25, 1968. The outlaw anthem is taken from Cash’s seminal live effort At Folsom Prison, which he recorded over two shows inside prison walls on Jan. 13, 1968, before releasing the album that May. He was inspired to write the song in 1953 while serving in the U.S. Air Force, after watching the 1951 movie Inside the Walls of Folsom Prison. He originally recorded and released it as a single in 1955 and it became a top-5 hit on country radio. But it wasn’t until he recorded a live version of the track in 1968 — which he performed for an estimated 1,000 prisoners — that it managed to cross over onto the pop charts, peaking at No. 32 on the Hot 100 that summer. Who allegedly sexually harassed whom? Did Brad Pitt allegedly sexually harass Gyneth Paltrow? After he threatened to kill Harvey Weinstein? I have just finished listening to a video about the Buchenwald camp. In the video, the narrator pronounces some of the words incorrectly, particularly German words, that have an e at the end of the word. I took the name “further glory” for my name on the internet — and the rest is history. Approximately a thousand years ago, several groups of people migrated from northern India, dispersing throughout Europe over the next several centuries. Though these people were part of several tribes (the largest of which are the Sinti and Roma), the settled peoples called them by a collective name, “Gypsies” — which stems from the one-time belief that they had come from Egypt. Nomadic, dark-skinned, non-Christian, speaking a foreign language (Romani), not tied to the land – the Gypsies were very different from the settled peoples of Europe. Misunderstandings of Gypsy culture created suspicions and fears, which in turn led to rampant speculations, stereotypes, and biased stories. Unfortunately, too many of these stereotypes and stories are still readily believed today. Throughout the following centuries, non-Gypsies (Gaje) continually tried to either assimilate the Gypsies or kill them. Attempts to assimilate the Gypsies involved stealing their children and placing them with other families; giving them cattle and feed, expecting them to become farmers; outlawing their customs, language, and clothing as well as forcing them to attend school and church. Though the Gypsies had undergone centuries of such persecution, it remained relatively random and sporadic until the twentieth century when the negative stereotypes became intrinsically molded into a racial identity, and the Gypsies were systematically slaughtered. 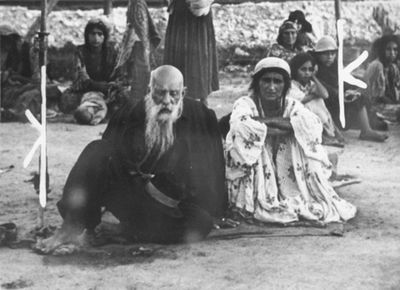 The persecution of Gypsies began in the very beginning of the Third Reich – Gypsies were arrested and interned in concentration camps as well as sterilized under the July 1933 Law for the Prevention of Hereditarily Diseased Offspring. In the beginning, Gypsies were not specifically named as a group that threatened the Aryan, German people. This was because, under Nazi racial ideology, Gypsies were Aryans. Thus, the Nazis had a problem: how could they persecute a group enveloped in negative stereotypes but supposedly part of the Aryan, super race? With this belief, the Nazis needed to determine who was “pure” Gypsy and who was “mixed.” Thus, in 1936, the Nazis established the Racial Hygiene and Population Biology Research Unit, with Dr. Robert Ritter at its head, to study the Gypsy problem and to make recommendations for Nazi policy. To study Gypsies, Dr. Ritter, his assistant Eva Justin, and his research team visited the Gypsy concentration camps (Zigeunerlagers) and examined thousands of Gypsies – documenting, registering, interviewing, photographing, and finally categorizing them. It was from this research that Dr. Ritter formulated that 90% of Gypsies were of mixed blood, thus dangerous. Having established a “scientific” reason to persecute 90% of the Gypsies, the Nazis needed to decide what to do with the other 10% – the ones that were nomadic and appeared to have the least number of “Aryan” qualities. At times Himmler discussed letting the “pure” Gypsies roam relatively freely and also suggested a special reservation for them. Assumably as part of one of these possibilities, nine Gypsy representatives were selected in October 1942 and told to create lists of Sinti and Lalleri to be saved. Though the Nazis did not discover a “scientific” reason to kill the ten percent of Gypsies categorized as “pure,” there were no distinctions made when Gypsies were ordered to Auschwitz or deported to the other death camps. By the end of the war, it is estimated that 250,000 to 500,000 Gypsies were murdered in the Porajmos – killing approximately three-fourths of the German Gypsies and half of the Austrian Gypsies. So much happened to the Gypsies during the Third Reich, I created a timeline to help outline the process from “Aryan” to annihilation. Gypsies are shown in the photo below. The Gypsies of Europe were registered, sterilized, ghettoized, and then deported to concentration and death camps by the Nazis. Approximately 250,000 to 500,000 Gypsies were murdered during the Holocaust – an event they call the Porajmos (the “Devouring”). What does the term “Holocaust” mean? The Holocaust was the systematic persecution and murder of approximately six million Jews by the Nazi regime and its collaborators between 1933 and 1945. The Nazis, who came to power in Germany in January 1933, believed that Germans were “racially superior” and that the Jews, deemed “inferior,” were an alien threat to the so-called German racial community. Gypsies, people with mental and physical disabilities, and Poles were also targeted for destruction or decimation for racial, ethnic, or national reasons. What does “Final Solution” refer to? The term “Final Solution” refers to Germany’s plan to murder all the Jews of Europe. The term was used at the Wannsee Conference, which took place in Berlin on January 20, 1942, where German officials discussed its implementation. The Nazis used the term “Final Solution” to conceal the plan that, in its entirety, called for the murder of all European Jews by shooting, gassing and other means. Approximately six million Jewish men, women, and children (1.5 million children) were killed during the Holocaust — two-thirds of the Jews living in Europe before World War II. How many Jews were killed in the Holocaust? Between five and six million Jews – out of a Jewish population of nine million living in Europe – were killed during the Holocaust. It is impossible to know exactly how many people died as the deaths were comprised of thousands of different events over a period of more than four years. About half of the Jewish victims died in concentration camps or death camps such as Auschwitz. The other half died when Nazi soldiers marched into many large and small towns in Germany, Poland, the Soviet Union and other areas and murdered people by the dozens or by the hundreds.